Right from the starting line, Bizarre's vision for "PGR 4" was to create an emotionally-charged racing experience, where players become attached to their careers, profiles and vehicles. There are several new features that embody this emotional experience, the most significant being the new career mode. Drivers are rewarded with a growing fanbase that'll cheer them on, react to their every move and support them through victory. One of the new gameplay elements is the dynamic weather system. Now racing through a track can mean facing an unexpected rain storm or snow flurries in the middle of a race. 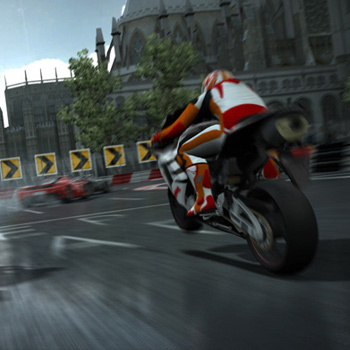 This results in changing physics when powering around a corner on the wet or icy surface in Shanghai and St. Petersburg or any of the game's 10 other locations. So, if you think driving on a dry track is boring... Flair and driving style now are just as important as technical skill, as players passing their opponent at full speed pump their fists and exhibit more emotion as they earn recognition with the revised Kudos system. The Kudos are worthwhile too, because the new A.I. personalities are be able to perform bold new driving maneuvers as they race side by side with other drivers.